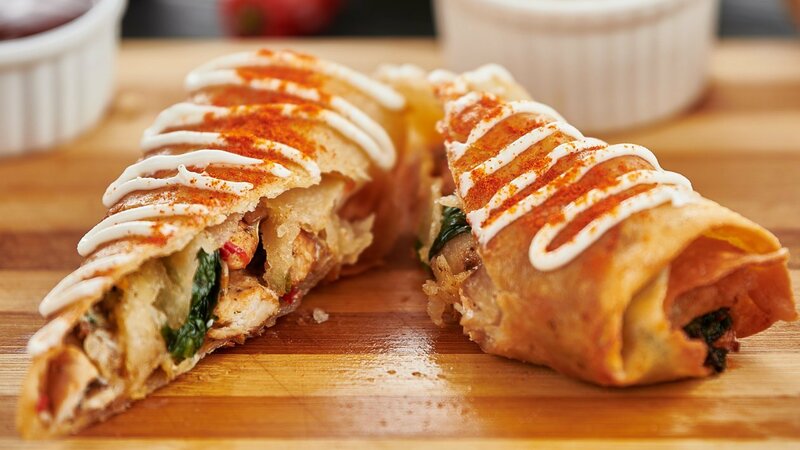 Chimichanga is a deep-fried burrito that is popular in Tex-Mex, Southwestern U.S. cuisine. The dish is typically prepared by filling a flour tortilla with shredded chicken. 1.Sauté chicken in a frying pan until tender and no longer pink. Allow to rest for a few minutes. 2.Combine pepper, chicken, spices and onions in a bowl with Hellmann’s Classic Mayonnaise. 3.Arrange tortilla on a clean surface, equally divide the above mixture and place in the middle of each tortilla length wise. 4.Fold opposite sides over filling and roll up like a burrito. 5.Heat the skillet over medium heat and pan fry both sides for 2-3 minutes until Chimichangas turns golden brown. Combine all ingredient together with salt to taste. Serve warm Chimichangas with Salsa, Guacamole, Nachos and Sour Cream aside.